Shogun Fish Company’s Larry Miyamura is making do. Until two years ago, he caught local Chinook or King salmon and sold it exclusively at Ferry Plaza. Now, with the California salmon season canceled for the second year in a row, he’s stopped fishing and finds that the re-sale part of his job has gotten a quite a bit more complicated. This season, Shogun Fish Company will have a few local offerings such as sardines, sand dabs, halibut, calamari and black cod, and some hand-selected items from outside the area, like scallops from Massachusetts and wild American shrimp from Louisiana. Miyamura is committed to offering sustainable seafood choices, so he stays up-to-date with the Monterey Bay Aquarium’s Seafood Watch List, even when it means changing plans mid-stream. One type of yellowtail he was planning to sell this season, for instance, just moved to the red list of products to avoid. “It’s always changing and requires constant vigilance,” he says. But the work pays off and makes Miyamura much more of a resource than your average fish vendor. Salmon used to make up the lion’s share of the local fishing industry this time of year; now local fishermen are, by and large, out of a job. According to the California Department of Fish and Game, last year’s salmon season closure resulted in a loss of $255 million and 2,263 jobs. This year, the federal government has created a $53 million disaster fund for fishermen in California and Oregon. One sign of the times is the underutilized fish receiving station at Scoma’s, the iconic Fisherman’s Wharf restaurant. The restaurant owns its own boat and had a fisherman on staff for several years. The receiving station connected the restaurant to the water and had windows that allowed the public to watch fresh fish arrive every morning. Now, the space serves as a storage facility. Steve Scarabosio, Scoma’s executive chef, says he still serves some local fish, but the list has diminished. “The local rock cod, petrale sole and sand dabs are great, but we really miss the King salmon. I think it’s the best in the world,” he says. Glen Spain of the Pacific Coast Federation of Fishermen’s Associations (PCFFA) is more optimistic. He believes 2010 could see some change for the positive, but explains that there’s a delay at work. 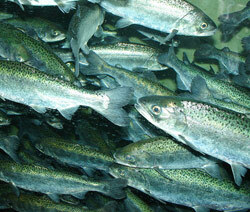 The Chinook salmon’s life cycle lasts around 3-4 years. They swim through the Sacramento/San Joaquin Delta and out to the ocean (usually north) as juveniles, then return 3 years later as full-grown adults ready to spawn. So this year’s salmon season is inherently linked with the conditions the juveniles faced three years ago. In 2005 and 2006 a record number of gallons of water was taken out of the Delta (and shipped south to be used for agriculture). During those years, the water quality was especially poor. “In recent years, only about 8% of the baby salmon have survived to get to the ocean at all,” says Spain. In 2007 a federal court mandated that more water be left in the delta. And, according to Spain, the survival rates are improving accordingly. “We expect that there will be an upsurge of salmon next year,” he says. In the meantime, Spain says the good news is that the river that produces the most salmon — the Columbia — has seen an improvement in the stocks. He believes the fisheries in Washington and Alaska are still a good choice for consumers looking for sustainable salmon. Larry Miyamura of Shogun Fish Company agrees. He will be offering Alaskan salmon caught by a small-scale husband-and-wife team from Juneau beginning tomorrow.